What gives? 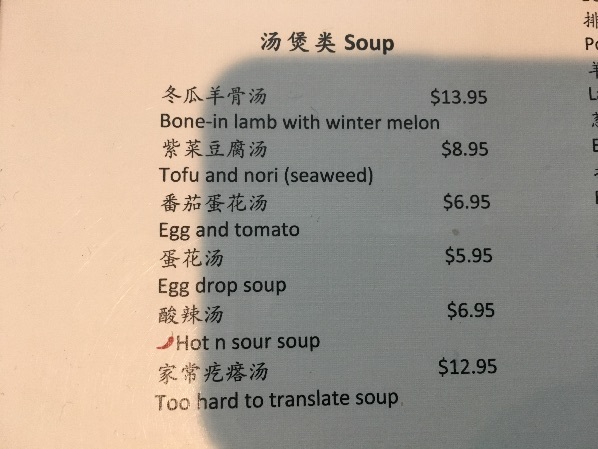 The rest of the translations of the soup dishes on this menu are not bad (fairly standard). What happened with the last one? When I asked the waiter what the last item was, he couldn’t describe it either. He just hemmed and hawed, gesticulated a lot and kept saying it included ‘flower’ (or ‘flour’?). I asked him to just translate the Chinese name and that didn’t work either. Ideas? Google Translate offers "Home-cooked soup", which doesn't account for the main ingredient. Bing Microsoft Translator has "Homemade pimple Soup", which is decidedly unappetizing. Baidu Fanyi gives "Dough Drop and Assorted Vegetable Soup", which ignores the first part of the name and adds "Assorted Vegetable". The problem is with gēda 疙瘩, which is one of those very cool, two syllable Sinitic words, neither of whose syllables means anything by itself (i.e., not only is it a disyllabic lexeme, it is also a disyllabic morpheme). Furthermore, gēda 疙瘩 is highly polysemous, with the following meanings: "pimple; knot; swelling on the skin; lump; nodule; blotch; a knot in one's body or heart (–> hangup; problem; preoccupation)". I remember when my mother-in-law first made this soup and served it to the family, I almost didn't want to eat it because the name sounded as though it meant "zit soup" (it also looked fairly ghastly). Note that both of the constituent sinographs of this word have as their semantic classifier the "sickness" radical, Kangxi number 104: 疒, pronounced chuáng or nè. Usually, if you see a character with this semantophore, you know it's bad news, because it has to do with illness and malignancy. One of my favorite Chinese expressions derived from gēda 疙瘩 is jīpí gēda 雞皮疙瘩／鸡皮疙瘩 ("goosebumps; goose pimples"), which I often experience when describing something deeply moving, eerie, or transcendent. You make it by mixing flour (that's what the waiter was trying to tell David) and water into a runny paste, then dropping it glob by glob, blob by blob into a pot of boiling water. It's a kind of quick and dirty way to make pasta. It's not "too hard to translate" after all, once you get over the gēda 疙瘩 ("hangup") of thinking that something that is supposedly edible also has pustular connotations. So, then, apparently it’s rivel soup. Question is rather, why didn't you just order it to see what it is. Maybe what they served him might have been something he really didn't like, then it would go to waste. Victor, as one who has translated menus myself (French to English), I particularly enjoyed your post. However you never revealed how your mother-in-law's homestyle dough drop soup tasted? If it weren't Chinese it could be like the western chicken and dumpling soup where the dumplings are just boiled dough/batter. So its like mini dumplings. Because its a Chinese restaurant it would cause confusion. I grew up on that. also cats ear mao erduo. It wasn't one of her best dishes. I think that David did the right thing: he asked Language Log and got a precise answer without wasting anything. I first thought along the lines rootlesscosmo, but Spätzlesuppe seems to be made usually with pre-formed Spätzle. Some form of Entropfsuppe (my grandmother called it Tropfsuppe). Austrian recipe here: https://www.gutekueche.at/eintropfsuppe-rezept-1866 . Spätzlesuppe today is usually made with pre-formed Spätzle, but today nearly all noodle-related foods are pre-made. Spätzle should be made just like this soup. "keitto" is the Finnish word for "soup". According to Wiktionary, it derives from "keittää" (to boil/cook). I couldn't find further etymological information. Do the q's in the Wu denote an actual consonant, or is it some sort of tonal notation? The q's in the Wu denote a glottal stop, which is what all checked tones have evolved to in Wu. Not all transcription schemes use "q", though, some have h or k.
If watching this video is anything to go by: https://www.youtube.com/watch?v=T5BQ2RvsdFI then there's a type of noodle / dumpling / gnocchi made in Central Europe that is produced in a similar way—dropping a dough mixture into boiling liquid—called "spätzle" or "spaetzle". These can also be used to make soups that would be vaguely similar to the Chinese one, see: https://www.yummly.com/recipes/spaetzle-soup. Here in Hungary, pasta like that is called "nokedli" or "galuska", but here it's normally served with things like pörkölt (a sort of bœuf bourguignon). The first two syllables of Hungarian "nokedli" are reminiscent of "gnocchi". The word gnocchi may be derived from the Italian word nocchio, meaning a knot in wood, or from nocca (meaning knuckle). It has been a traditional type of Italian pasta of (probable) Middle Eastern origin since Roman times. It was introduced by the Roman legions during the expansion of the empire into the countries of the European continent. In Roman times, gnocchi were made from a semolina porridge-like dough mixed with eggs, and are still found in similar forms today, particularly the oven-baked gnocchi alla romana and Sardinia's malloreddus which do not contain eggs. The use of potato is a relatively recent innovation, occurring after the introduction of the potato to Europe in the 16th century. Potato gnocchi are particularly popular in Abruzzo, Friuli-Venezia Giulia, Veneto, and Lazio. As with other mashed potato dishes they are best prepared with starchy potatoes to keep a light texture. type of small potato dumplings, 1891, from Italian gnocchi, plural of gnocco, from nocchio "a knot in wood," perhaps from a Germanic source akin to knuckle (n.), gnarled, etc. So called for their shape. mid-14c., knokel "finger joint; any joint of the body, especially a knobby one; morbid lump or swelling." Perhaps in Old English, but not attested there. Common Germanic (compare Middle Low German knökel, Middle Dutch cnockel, German knöchel), literally "little bone," a diminutive of Proto-Germanic root *knuk- "bone," which is not represented in English in its simple form (but compare German Knochen "bone). For pronunciation, see kn-. Mrs. Chiang's Szechwan Cookbook has a recipe for a pork soup with dumpling knots that fits the description perfectly. Ellen Schrecker, the author, describes the dumplings as identical to spätzle. I've made this recipe many times. It's a perfect cold-weather soup. We call it bantan in North Mongolia. In Bortal, it’s mantan. It’s a classic baby food. I took a look in my "cooking encyclopedia" (中国烹饪辞典, 主编萧帆 1988) and did a search for geda. It seems in the Northeast that name is linked to round cabbages and mustard greens. If you do an image search for 疙瘩菜 or 疙瘩白, you can see what I mean. I've come across that soup before, but by a different name: "flicked (?) fish" [noodles], or 拨鱼. No ideas on whether this soup name might be linked to a non-sinitic word. LOL, 疙瘩汤 is indeed very hard to translate but you already came up with a good translation. I'm very surprised to see this in a restaurant menu, because this is a very northern style comfort food when you run out of time and ingredients to cook. I think I made it only twice in the past five years. In Dongbei topolect, we have a phrase "老疙瘩“ which refers to the youngest child in a family. The youngest child is always the most beloved child in a family, so I think 老疙瘩 also means 心头肉 of parents. 老 sometimes means 小 in Dongbei topolect (for example, 小姨=老姨 小叔=老叔), so 疙瘩 could mean child or treasure. What's more, we may also use 一小疙瘩 to describe some small places or some things. In this way, 疙瘩 may means something small. In some Dongbei restaurantsi, 疙瘩汤 is also known as 珍珠翡翠白玉汤. As what you have written in the language log, 疙瘩 is really unappetizing. So I think that's why restaurants change its name. 珍珠翡翠白玉汤 is easy to translate as ”Soup of pearl, emerald and white jade". Thank you for sharing this with me. After reading your blog, I am so hungry now. I can still remember the day when I first ate it almost 20 years ago in Beijing, made by my mom's aunt (舅媽). It was my first meal after getting off the train and probably my first meal ever in Beijing. It is one of the best tastes in my life, although I don't enjoy geda tang that much nowadays. I find it interesting that the name "疙瘩" bothered you at first. I agree that 疙瘩湯 might not look so delicious at first, but its name never reminds me of anything bad. To me "疙瘩" does not necessarily refers to those nauseating things on the skin, unlike "痘" and "疹" which would definitely make people uncomfortable. It is more of a neutral word than a negative one. Not only "麺疙瘩" (dough drop) would show up on a menu, there is also another dish called "菜疙瘩" (vegetable ball?). I also remember that one of my old neighbors, a little boy, was called "小疙瘩" by some adults because he was so tiny and everything on his face is so close to each other (eyes, mouth and nose). So probably "疙瘩" refers more to the shape of a knot, or even a small cube or ball, and does not necessarily denote the connotation of "sickness". Your translation of the name and description of how it is made are so accurate. I will keep in mind and probably help some restaurants improve their menu some day. It is surprised to know so many European food similar to geda tang. I am also very glad to know that all of them don't really have a good look (not only geda tang). Ha ha ha! It is fun to read the geda tang. You guys made it so complicated. I am very good at making it, and everybody enjoys my geda tang. But, like Dotno mentioned, in 山西、陕西、河南、内蒙，people call it ban tang 拌汤，and so do my family。拌here means you stir the flour with drops of water to make little “knots” before you put them in the boiling pot. 疙瘩汤 is more like 北京话 [Pekingese]。People in the south rarely eat geda tang. There are different ways to make the “geda”. Somebody mentioned paste-like flour drops, that is one way; 拌is another way；and in some places, people simply pour dry flour in the boiling pot and stir it immediately. Geda tang may be called Chinese macaroni soup. Very funny. And I love the honesty of too-hard-to-translate! Maybe we should add that to PhD thesis style sheets. "mixing flour . . . and water into a runny paste, then dropping it glob by glob, blob by blob into a pot of boiling water." A satisfactory translation to many English speakers likely to patronize Chinese restaurants would be "matzoh ball soup." 疙瘩 is more of a descriptive expression. Anything solid and in a shape of ball (usually not very round or smooth) can be said a geda. One can say 线疙瘩（a ball of thread, or a knot of thread), 石头疙瘩（a piece of rock or pebble), 面疙瘩（a chunk of dough), 纸疙瘩（a randomly rolled ball of paper before casting away); or 我脸上长了一个小疙瘩（there is an acne grown on my face); or 我的头碰了个大疙瘩（I got a big bump on my head), etc. @Victor Mair, the etymology for 'nokedli' is ultimately from German, but via a different route / root. Paraphrasing from Gábor Zaicz's "Etymological dictionary": Nokedli entered Hungarian, 1874, via the Austro-Bavarian word 'nockəl / nockerl', which is itself derived from the High German noun 'Nock' (also Nocke), meaning an 'imposing, craggy peak'. Etymological trivia: a 'nock' in English is the "notch at either end of a bow for holding the string" coming from Middle Dutch nocke ‘point, tip’. In the Czech and Slovak Republics they have halušky and in Poland they have 'kluski lane' ("poured noodles"). Both of these contributed to the Hungarian term galuska as this entered Hungarian from Polish, 1683, and later again from the Slovakian haluška, 1788. My source for the Hungarian etymologies is Zaicz Gábor's "Etimológiai szótár" (Tinta Könyvkiadó, 2006), the entry for nokedli in Hungarian being: "nokedli  Német, közelebbről bajor-osztrák jövevényszó, vö. bajor-osztrák nockəl, nockerl 'galuska', melynek előzménye a felső-német Nock 'tömör, egyenetlen kőszikla' főnév. A magyar li végződésre vö. hokedli." from Zaicz Gábor's "Etimológiai szótár" (Tinta Könyvkiadó, 2006 downloadable here: https://www.tankonyvtar.hu/hu/tartalom/tinta/TAMOP-4_2_5-09_Etimologiai_szotar/adatok.html). Further etymological trivia, words ending in ~dli in Hungarian are likely to have come from some Austro-Bavarian source. Having said all that, my favourite name for any form of pasta in any language is the Italian strozzapreti, 'priest stranglers'. I can see your point about the similarity with matzoh ball soup, but matzoh balls are much bigger and regularly round in shape, whereas geda are small (as pointed out in many of the above comments) and irregularly shaped. I agree this stuff sounds similar to Spätzlesuppe. But the discussion of the name reminded of another soup with an unappetizing name when translated literally into English: Schleimsuppe. I was taught to make Spaetzle, or nockerli, by my Transylvanian late husband's family members, and it sounds very much the same as geda — how to make noodles without special smoothing and cutting equipment, OR how to make noodles that have crevices and crenelations for sauce to cling in (an example of gourmet reversion to the more rugged "peasant" form of a food, like whole-grain bread; the peasant bread in my husband's village of origin bore much more resemblance to what Whole Foods sells than did the elite refined white bread that was long the status signifier in Europe). . . . One wonders, given the provenance, whether this way of making noodles was one of the gifts of Genghis Khan, along with all those genes. The Transylvanian Saxons lived directly in the path of repeated invasions from the steppes to the east — each village had a "peasant fortress" for refuge on top of a nearby Carpathian foothill — but it was often too late to keep the genes out, and maybe the noodles. My husband's paternal grandfather was born with the "Mongolian spot" on his tailbone, and was described to me by someone who saw his photo as "the most Chinese German I ever saw." @Fionnbharr Thanks for the link. If I'd known it was online I wouldn't've brought one back from Hungary! In my mom’s hometown, they also make/eat this kind of 疙瘩汤. It’s similar but not exactly the same. But it has a very cute name “猫耳朵 cat ear”. I guess this name is more appealing than “pimple/zit soup”. I love the idea of calling it "hangup soup."